Formerly in brown morocco; rebound for E.M. Baucel in blue levant morocco doublé in white vellum tooled in gold to an Eve design by Georges Trautz-Bauzonnet; in pigskin box case. 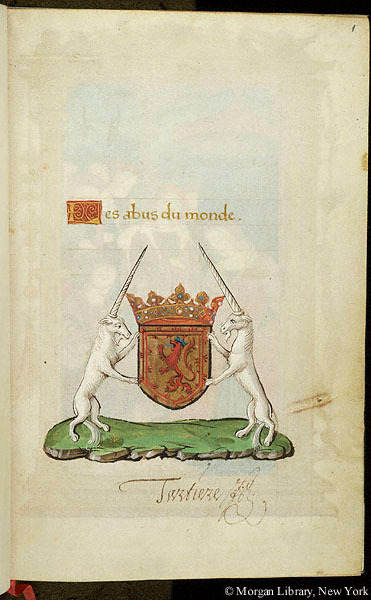 Executed in France for James IV of Scotland (1473-1513) in the first quarter of the 16th century; his arms, a red lion and two unicorns on fol. 1; possibly belonged to Queen Mary of Lorraine, consort of James V of Scotland (mother of Mary, Queen of Scots); owned (17th century) by Tartière; probably Vicomte de Morel-Vindé sale (Paris, 1823, no. 1400: said to be in blue morocco); J.J. Techener; Charles Nodier sale (Paris, 1844, no. 344) to N. Yemeniz; his sale (Paris, 1867, no. 1723) to E.M. Baucel; his sale (Paris, 1882, no. 248) to Morgand; Bull. Morgand 14 (1883) no. 8262 = inventory no. 20796; George B. De Forest Collection (Grolier Club exhibition, 1892, no. 6; purchased by J. Pierpont Morgan (1837-1913) with the De Forest Collection in 1899; J.P. Morgan (1867-1943). Ms. written and illuminated in Rouen, France, ca. 1510. Decoration: 14 full-page miniatures with architectural frames; small illuminated initials throughout.